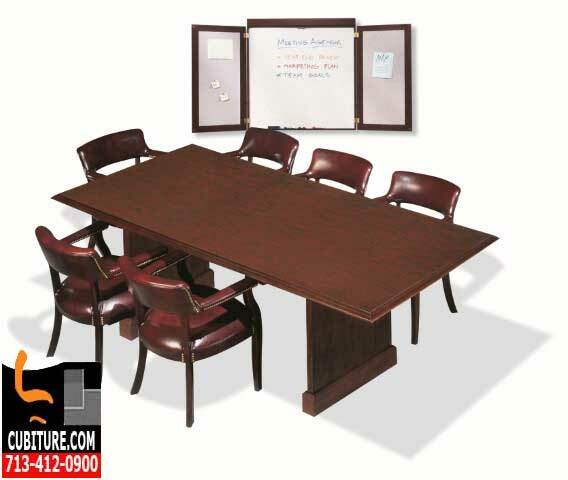 The conference table is the central focus of meeting room design. As such, it must combine function and form in a manner that not only balances the room, but brings people together in the room to accomplish the agendas of the day. No matter how large a meeting room is, it is inescapably designed for a limited number of people. While it may be a place where information is dispensed, it is primarily a place for making decisions in a focused, collaborative environment. As such, it is very different from audience or theater setups that position people to hear a message delivered by a speaker(s). In many ways, we could compare conference tables to vehicles we purchase. Our vehicles carry us to destinations and make a statement in the process. Tables are vehicles for collaborative decision making. The size, materials used in its construction, and shape of the table play a definitive role in setting the tone for collaboration. It is therefore important to invest appropriately in a table that will set a tone most appropriate to your corporate culture and business objectives. Aside from individual work-spaces and seating, it is the most important office furniture investment you will make because decisions made in the meeting room have a direct impact on the financial prosperity and future growth of your organization. The look of a conference table matters as much as its size. Its appearance sends a message to every person who enters the room. For example, if the surface of the table is made from thick hardwood, such as walnut or cherry, it establishes a very formal emotional tone. On the other hand, installing a table that is made of metal or glass conveys a much more contemporary and upbeat tone. Materials used in table construction include glass, solid wood, laminate, metal, and hard wood veneer. Small conference tables establish a very tightly knit mood where conversation between a few key decision makers sets the tone for the meeting. It is by nature more collaborative and interactive. The larger the table is, the more people are seated at the table. The conversation shifts from intimate collaboration to that of contribution from a broad range of perspectives. The person at the end of the table often makes the final decision based upon the contributions of all members in the group. With a smaller, and particularly round or square table, there is more of a democratic process where all members arrive at a decision together. Seating a specific number of people, to some extent, will depend upon the size of the conference table. However, it is important to remember as well that a large surface is not always necessary to accommodate a group of people. Generally speaking, the typical conference chair requires 2 `1/2 space to comfortably seat an attendee. 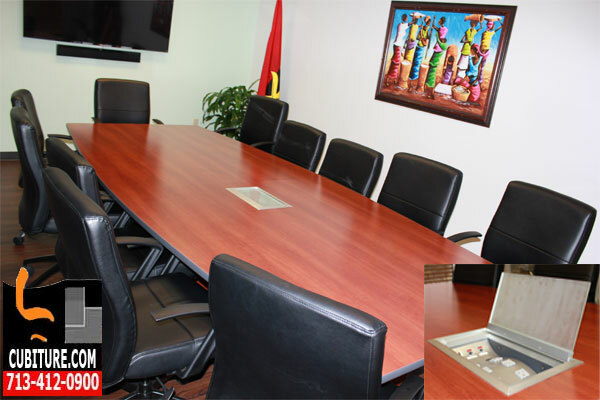 This means that a very large meeting of 15 people can be accommodated by a 15-foot table. For comfortable seating, we recommend you have at least 4 feet of wall behind each chairs so the room does not feel cramped to your guests. In a smaller space that requires a higher than average number of guests, a round table may be preferable to the standard oblong table we typically visualize as standard boardroom fair. In addition to functioning as the focal point of your meeting space, your conference table also functions as a hub of communications. Verbal communication is a given, but have you thought about the many other forms of communication that typically occur in today’s meeting space? Most attendees are going to need Internet access to reference materials being discussed during the meeting. This usually means good, reliable Wi-Fi is a must. There may also be a need for special telecommunications equipment that will facilitate conference calling. Video may also be a component of conferencing, so the best communications equipment may be needed to ensure reliable connectivity. Most meeting rooms also have their own lighting controls and a projection screen to use for presentations. 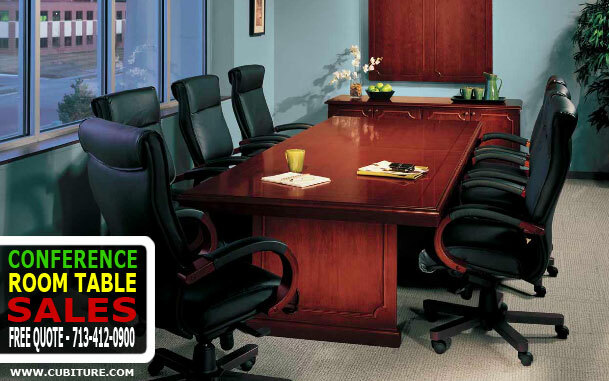 Conference tables made from wood laminate are the least expensive. Solid wood costs 3-5 times more. Metal surface tables are not very popular, but many tables use metal legs or pedestals as a cost-saving measure. When balancing the cost of conference tables with that of accompanying accessories, you can get the most from your investment by requesting a free office space layout design. Call 713-412-0900 now to develop all your meeting room requirements from the perspective of focused utility balanced with superb aesthetic.